Fleetwood Mac opened their fall 2018 tour at the BOK Center in Tulsa, OK on October 3. 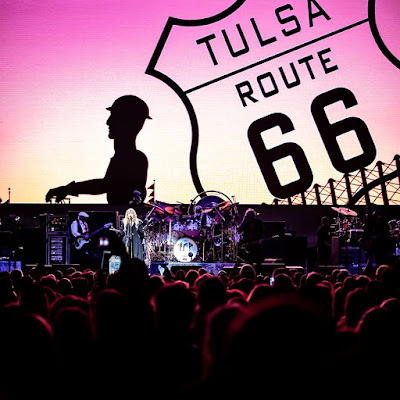 The band’s first trek without longtime guitarist Lindsey Buckingham saw new additions Mike Campbell of Tom Petty’s band and Neil Finn of Crowded House in the lineup for the two and a half hour show, according to Tulsa World. But the first hint Fleetwood Mac was going to dig deep came six songs into the show, when Stevie Nicks handled vocals on “Black Magic Woman”; written by former member Peter Green, the song went on to become a hit for Santana in 1970. Also offered were “Tell Me All the Things You Do” from the 1970 album “Kiln House,” the Bob Welch-penned “Hypnotized” from the 1973 album, “Mystery To Me”, and “Oh Well,” which was sung by Campbell and was originally recorded by Fleetwood Mac in 1969. Finn took center stage for vocals on a pair of songs from his former bands: “I Got You” by Split Enz and “Don’t Dream It’s Over” by Crowded House, while Campbell’s former band leader, the late Tom Petty, was honored with a tribute performance of “Free Fallin’” during the encores. Fleetwood Mac’s extensive North American tour is scheduled to run into the spring of 2019.